I have been spending a lot of time this year exploring county Carlow and this is just another reason why. Black Castle was one of those surprise finds which I regularly come across. 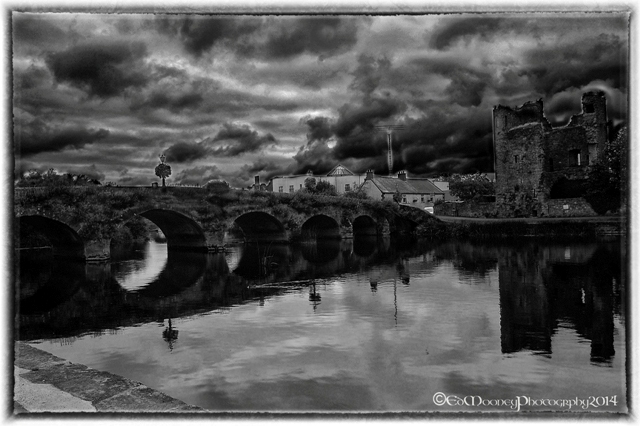 I was actually heading down south to St. Mullins when I was passing through Leighlinbridge and caught a glimpse. After finding a safe place to park across the bridge I made my way back toward the castle ruins. What you see now are the ruins of a Norman Tower house and Bawn which dates back to the sixteenth century, but the site itself is much older. The first Castle to be built here was back in 1181 after the surrounding lands were taken from the native Irish clans during the Norman invasion. There is some conflicting evidence as to who built the original fortification! The majority believe that Hugh De Lacey, the then Lord Governor of Ireland under Henry II built the first castle to protect an important crossing point on the river Barrow, whilst a small proportion claim that John de Clahull built one of the earliest Castles in the Pale here. From what I have been able to ascertain, De Lacey did in fact build the first castle here, but then granted it to De Clahull, as was common practise in those days. The original Castle was responsible for the development of a strategically important crossing on the Barrow in its time, similar to White Castle in Athy.Beside the castle there was a Carmelite priory, founded in 1270. In 1320 another castle was built on the site, it was from this point that Black Castle took its name. During the 14th century, the Kavanaghs reclaimed most of their land in the area, including the castle. In a twist of fate, the Kavanaghs charged English lords “black rent” for safe passage across the river for nearly 150 years. 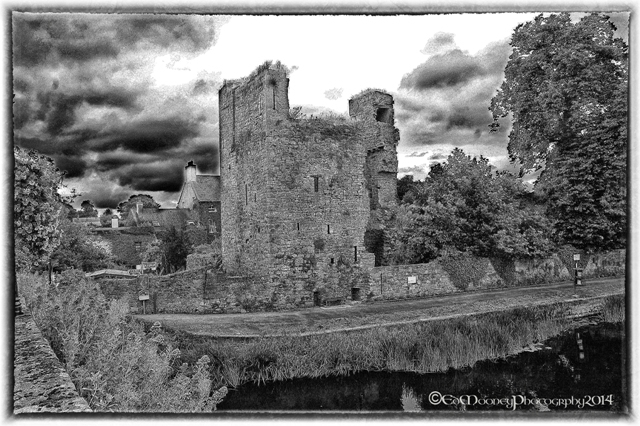 There is no longer any visible sign of either castle, but in 1547 another Lord Deputy of Ireland Sir Edward Bellingham began construction of the Black Castle that you see today. Black Castle or Leighlinbridge Castle (Leithghlinn an Droichid, meaning Glen-side of the Bridge in Gaelic) sadly is on private grounds which does not seem to be accessible to the public. 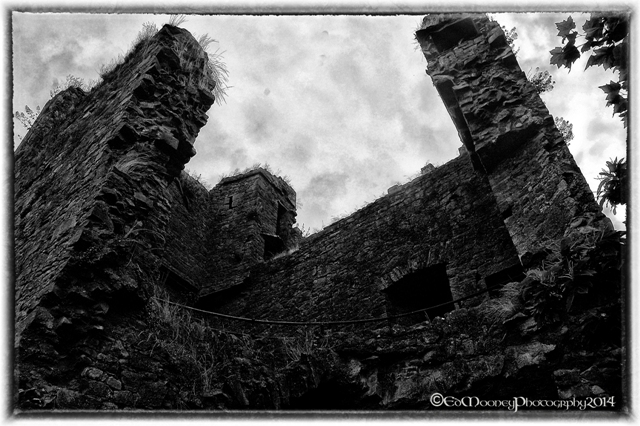 Much is hidden behind the Bawn but it is possible to see much of the interior of the tower from the collapsed walls. All that can be seen of the present structure is a rectangular 50-foot-tall broken castle tower (part of the south-east corner has collapsed) and Bawn wall which is situated on the east bank of the Barrow River. There is a barrel vault over the ground floor and attic, with one floor above. 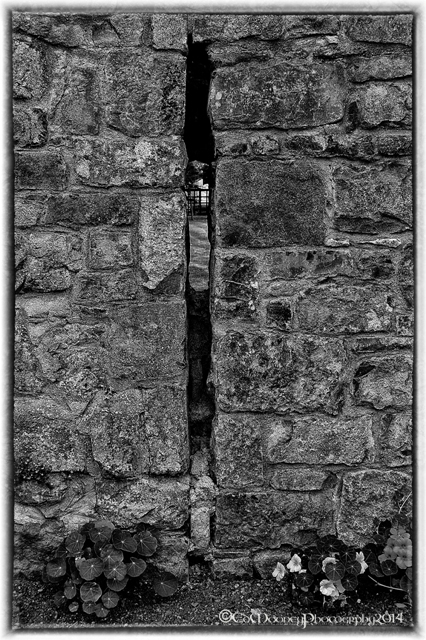 What would have been the main entrance in east wall was protected by a machicolation and a murder hole in a window seat. There are remains of a mural staircase which gave access to attic floor and spiral staircase above the vault. There also appears to be what might have been two small chambers in the curtains of the vault. The wall walks are covered on the north & south walls, but are open with crenelations on the east and west walls. 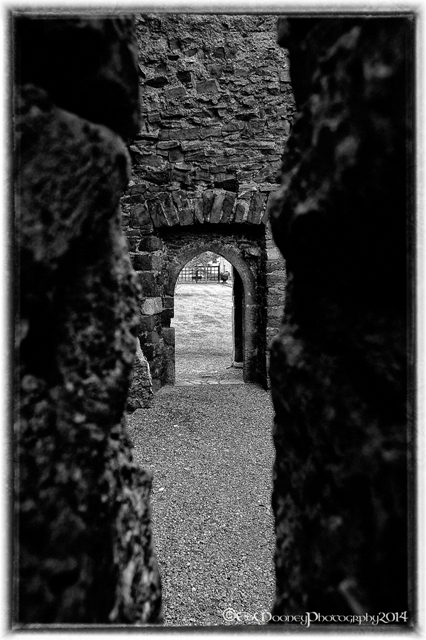 A corbelled chamber is said to cover the stair turret on the north-east corner.Eventually the castle was destroyed by Cromwellian forces, under a Colonel Hewson, in 1650 during the Irish Confederate Wars. 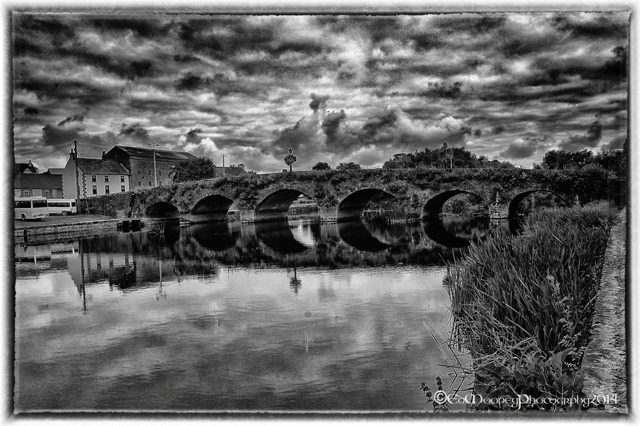 The magnificent nine-arched Valerian bridge over the Barrow river near the castle was built in 1320 by Maurice Jakis, a canon of Kildare Cathedral. It was later widened in 1789. 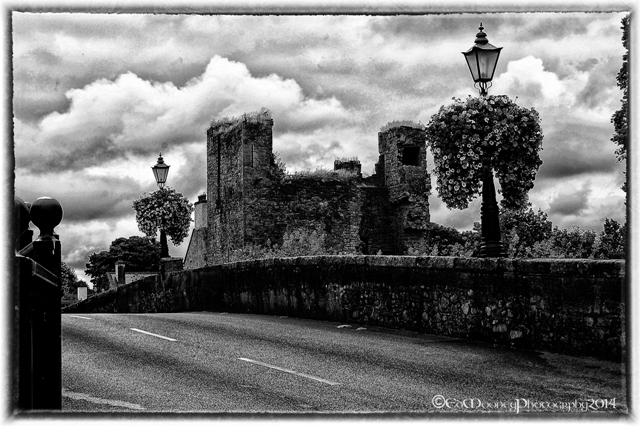 This entry was posted in Castles, Diary of a Ruinhunter, Medieval, Photography and tagged Black Castle, Carlow, Castle, Ireland, Leighlinbridge, Medieval, Nikon, photographer, Photography, Travel. Bookmark the permalink. Ed. Once again, another fascinating historic narrative and you’ve captured the mood and sense of atmosphere of Black Castle in your photos. Very interesting. Thank you. Some great shots! The last one is just amazing! Thanks Amanda, glad you liked them, its crazy how the skies can change so quickly. fantastic photos full of mood!! Hi Ed, nice post again. Always enjoy reading it. Although sometimes i have to think hard what you mean. Language and history barrier. 😉 But the photos are great again. Beautiful photos! Sad you can’t access the other ruins. True! 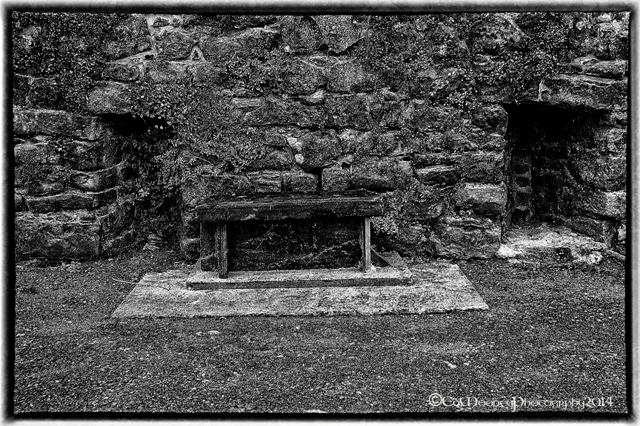 Ireland’s history is full of it! Great pics – you are gradually forcing the issue of when I should get round to visiting Ireland. That sky really came out well. What a Gothic feel the place has! Great, atmospheric shots! once again the history you provide creates that feeling of stepping back in time into the magnificent photos. One more place I hope to visit!! Thanks Cybele, Im doing it right so, when you coming over? Wow that first photo is particularly moody. Great post! And I agree with one commenter above: I need to get back over to visit. It’s been more than 10 years since I last travelled around Ireland. Thank you Kate, much appreciated. You should come back, perhaps I might have provided a few good places to explore? Jeez… That’s another batch of great shots and such amazing skies. Dead cool.